Shop online for over 1,200 berkina model trains at discounts up to 22%. Roadway is the most popular of the 6 berkina model trains categories, then Passenger Cars, and Locomotives. This is a Model Railroad Vehicle of the Volkswagen Old Beetle Economy Assembled HO Scale by Berkina Automodelle. This is a Model Railroad Vehicle of the 1960-63 Volkswagen Samba T1b Passenger Van Assembled Various Colors HO Scale by Berkina Automodelle. This is a Model Railroad Vehicle of the 1972 Chevrolet Camaro Z28 Assembled Starmada(TM) Gold HO Scale by Berkina Automodelle. This is a Model Railroad Vehicle of the 1959 Chevrolet El Camino Assembled Starmada(TM) Gold HO Scale by Berkina Automodelle. This is the HO Scale Passenger Car VT 402 WEG from Brekina Auto. 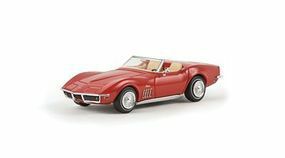 This is a Model Railroad Vehicle of the 1967-1973 Chevrolet Corvette C3 Assembled Starmada(TM) Top Down (Signal Red) HO Scale by Berkina Automodelle. This is the HO Scale VW HD Van Economy from Berkina Automodelle. This is a Model Railroad Vehicle of the 1972 Chevrolet Camaro Z28 Assembled Starmada(TM) Highway Patrol (Black & White) HO Scale by Berkina Automodelle. This is the HO Scale Volvo Station Wagon crimson from Berkina Automodelle. This is a Model Railroad Vehicle of the 1964 Dodge A 100 Pickup Truck Assembled Red HO Scale by Berkina Automodelle. This is a Model Railroad Vehicle of the 1948-1971 Morris Minor Sedan, Right Hand Drive Assembled Starmada(TM) (Ruby Red) HO Scale by Berkina Automodelle. This is a Model Railroad Vehicle of the 1964 Dodge A 100 Passenger Van With Camper Roof Add On Assembled Custom Sportsman Light blue & White HO Scale by Berkina Automodelle. This is a Model Railroad Vehicle of the 1964 Dodge A 100 Passenger Van Assembled Custom Sportsman Gray & White HO Scale by Berkina Automodelle. This is the HO Scale VW T1b Van Assorted Colors from Berkina Automodelle. This is a Model Railroad Vehicle of the 1948-1971 Morris Minor Sedan, Right Hand Drive Assembled Starmada(TM) (Cobalt Blue) HO Scale by Berkina Automodelle.